He has the ability to change your day. He can affect your outcome. So you either love him or you hate him. You’re eating a meal, drinking a cold beer, and enjoying the night with a couple of friends. And then he comes out and you smile. You know the night just went from good to great. But for some it doesn’t turn out that way. You’re having an awesome day, the sun is shining. It’s a nice 70 degrees, no clouds in sight and everything is going your way, until he walks out. You shake your head, slump your shoulders, and sigh. You don’t even want to eat your hot dog any more. There’s nothing you can do. It’s over. You need two drinks now. You love him or you hate him. Most people from Boston hate. Me, I live in California so I don’t share the same hostility. He walks out. Six-foot-two and 185 pounds of Panamanian Awesomeness. 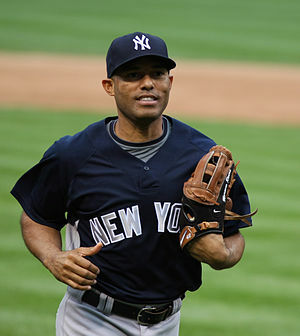 Mariano Rivera. You love him or you hate him. I’m not a die-hard Yankee fan but I’m a Mariano fan. I follow the player wherever he goes. So when I heard of his torn ACL injury ohhhhhhh I was bumbed out. He’s 42. In baseball years that’s not a good thing. It’s like being a model, not that I would know anything about that, seeing how I don’t wear heels, and I do wear Chapstick. But I imagine you don’t have too many 42 year-old models out there when teens and 20-somethings are doing the weird model-horse walk down the runway. So a 42 year-old baseball player with a torn ACL, not cool. He’s in hazard zone, in danger of being sent home permanently. But he is badass. He’s a closer. He’s the closer. He comes in to finish the job. He’s got over 600 career saves. I can’t tell you how many times I was watching a ball game at a bar and as soon as he came out to close the game you see haters looking at the waitress saying check, please. You see fans ordering another round in celebration of what was to come. He hadn’t even thrown the first pitch, but they knew. They knew. Now unfortunately he’s out for the season. But he’s a Yankee, so you never know. Perhaps back in time for the playoffs. This organization has massive amounts of cash. I’m sure they can find the best doctors out there to help out my man. If it can be done it will. But for now my man is down for the count. Even though he makes about $14 million a year, I still feel for him. I know what it’s like to tear an ACL in the prime of your season. Believe it or not, in my high school days I was a baller. I lettered in three sports for four years. Captain of two varsity teams and athlete of the year twice. I was badass, until I tore my ACL. Like Mariano … I was out. Unfortunately for me it happened during my senior year and I did not have $14 million. I felt bad for my man, but now in retrospect, I’m sure he’ll bounce back. It’s not like he’s a Guatemalan in his senior year of high school. 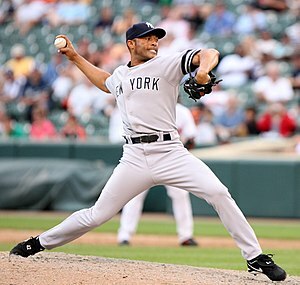 He Mariano Rivera … one of the most awesome Panamanians.